Robert Kirkman and Paul Azaceta are poised for another industry-wide, entertainment breakthrough success with their hot new series OUTCAST BY KIRKMAN & AZACETA. The first issue has sold out instantly, for a fourth time, and Skybound/Image Comics has rushed the hot new horror comic back to print. Cinemax has greenlit OUTCAST for a pilot episode with Kirkman confirmed to executive produce the series, a role he also holds for the wildly successful AMC television adaptation of THE WALKING DEAD. OUTCAST BY KIRKMAN & AZACETA #1 boasts a special double-sized first issue for just $2.99, and introduces Kyle Barnes, a man with a tragic past and a horrifying gift. Kirkman and Azaceta explore demonic possession and incorporate a subtle creeping terror that harkens to that of classic horror stories. The demand for the series continues to gain speed and is expected to draw in even more readers as further news of the television series hits mainstream media. For fans of digital editions, OUTCAST BY KIRKMAN & AZACETA #1 remains available for purchase across all platforms, including the Image Comics website (imagecomics.com), the official Image Comics iOS app, Comixology’s website (comixology.com), iOS, Android, and Google Play. This fourth printing of OUTCAST BY KIRKMAN & AZACETA #1 (Diamond Code JUL148057) will be available on 9/10. 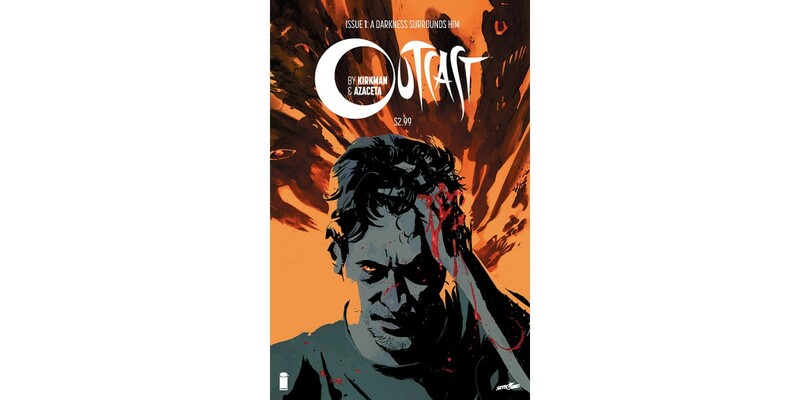 OUTCAST BY KIRKMAN & AZACETA #2, 2nd printing (JUN148240) is available now and OUTCAST BY KIRKMAN & AZACETA #3 (Diamond Code JUN140563) will be available 8/27.